Home / Registration-Blog / Quick Tips for Finalizing you Fall 2016 Registration! To our continuing undergraduate students, the last New Student Orientation registration session is August 18th! Starting August 19th (yes, we mean at 12am on 8/19th), the restrictions for first-years and transfers will be lifted and all of you have access to the remaining seats in those classes. Use Schedule Planner – You can see the number of seats left, and any reserve capacities on the classes. Check out the new video we posted showing you some new features, such as saving your favorite schedules. Utilize the ‘additional search criteria’ from your Shopping Cart class search to narrow down results for additional classes. If you’re looking for a History class that meets on Mondays, Wednesdays and Fridays between 8am and 10am, you select HIST into the Course Subject field and then populate the Meeting Start Time, Meeting End Time and Day of Week fields and click the SEARCH button. It is always helpful to read the class notes on your classes as well. This information may include details on how seats are being reserved or any special information about the classes. Remember to look at the number of credits on variable credit classes. When you’re adding a variable credit class to your shopping cart, it defaults to the lowest credit value. Update it from your shopping cart. Once the class has been added to your Shopping Cart, you can also readjust the credits, by clicking on the class again. And if you enroll in the wrong number of credits, use Enroll > Edit to easily update this. Remember that if you’ve placed yourself on a waitlist for a class, those will continue to run through the 5th day of the term. If you do not get into the class from the waitlist, you will be dropped from the waitlist when we purge them the day after the last date to add online. 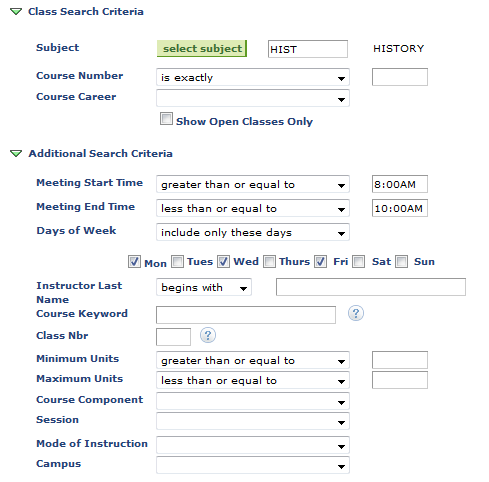 You can check your waitlist position number by viewing your Class Schedule in list view, and keeping Waitlisted Classes selected. We encourage you to check out other helpful registration resources on our website. We have quick tips, videos, and FAQ pages that will assist you with registration. As always, feel free to contact us if you have any questions. We are available by chat, phone, and email.